The Lion of Judah is no tame lion. Neither is he predictable. While walking along the streets of Jerusalem one day, Jesus sees a common enough sight in the Holy City. 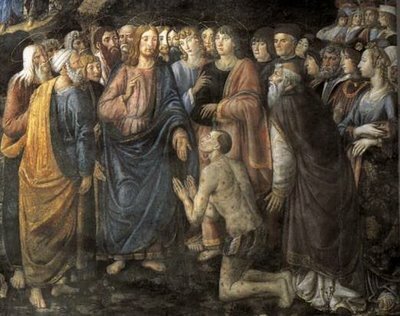 There is a disabled person by the side of the road begging (John 9). What else is the poor man to do? He has been blind from birth, so employment opportunities are limited. He has no ability to see, but he can speak. So he cries out for assistance. The disciples want to pinpoint the cause of the problem theologically. Whose sin brought down this judgment upon the poor man? Jesus is much more interested in solving the problem than analyzing it. But the action he takes is strange to say the least. He could have simply gathered a crowd, given a speech, the uttered dramatic command: “Be healed.” He did it this way with others. It would have been dignified enough. But no, his action is to spit in the dirt, make a paste of mud, and smear it on the eyes of the poor man, commanding his disciples to wash off the paste in the Pool of Siloam. What must the blind man and the crowds have thought in the interval between the smearing and the washing? Why did Jesus choose to do it this way? Because God made the dust of the earth, and saw it as good (Genesis 1). And out of it he formed the first man (Gen 2) which he saw as very good. Though many religious movements have shunned material things as base, unspiritual, and even evil, the God of Israel appears as a rather earthy divinity. He is so comfortable with the physical world that he even allows himself to be united to it forever, the Divine Word becoming flesh in the womb of Mary. The physical body of Jesus is a visible sign of what can’t be seen: his glorious divinity. But it is more than an empty sign calling to mind something that is not there. It makes visible and present that invisible divinity. From the body of Jesus goes forth divine power to heal the woman with the flow of blood and wipe away the sins of the paralytic. But sometimes, the Lord wants to use other earthy realities to contain and transmit his life-changing power. You can’t get more earthy than mud! But if God can use mud to heal and give new life, why not water? Why not bread and wine? Why not oil? What Jesus does for the man born blind is a sign of the whole sacramental economy of the Church he established. Physical symbols come to contain what they symbolize and transmit what they contain. Of course this is not brand new. It is prefigured and prepared for in the Old Testament. Special oil called chrism is carried by the prophet Samuel to the town of Bethlehem to be used in the anointing of a new king. The Philistines, a mighty people from the seacoast with superior weapons and military skill, oppress the people of Israel. The role of the King is to defend his people from their enemies, and this is a formidable foe. The King will need great strength to fulfill his mission, so he is to be anointed with sacred chrism . . . holy, perfumed oil first used to consecrate priests. It is carried in the hollow horn of a bull, a symbol of the power this chrism is intended to transmit. The smallest and seemingly weakest of the sons of Jesse is smeared with this oil, and from that moment, the power of the Lord rushed upon David, turning this shepherd into the first Lion of Judah (1 Sam 16). This prefigures the sacrament of confirmation, where the weak will be made soldiers of Christ, sharing in Church’s kingly mission of bringing all things into subjection to the King of Kings. The sacraments do not just symbolize, but actually transmit the awesome power they contain. And what is it that they contain? The merciful love of God that makes the weak strong, the humble wise, and ordinary people quite extraordinary.